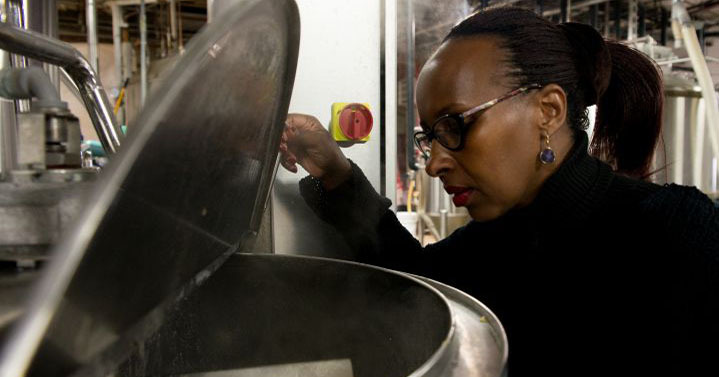 In this installment of Craft Brew News, we’re putting the spotlight on Rwandan entrepreneur – or our version, entreprebrewer – Josephine Uwineza. She’s set her sights on disrupting the pub culture in the Central African nation by opening the country’s first micobrewery. How cool is she?! Not only are there no craft breweries in Rwanda right now, but the first will be owned and operated by a woman. Inspiring? A resounding YAS! There have been microbreweries popping up all over South Africa, Kenya and Botswana, but they haven’t made their way to Rwanda. Until now. Not only is Josephine “Fina” a game-changer being a female opening the first brewery, the brewery will also provide training and employment to local women from nearby villages. “There’s no craft brewery owned by a woman in Rwanda—not only never owned by a woman, but there’s no craft breweries in Rwanda right now,” Uwineza told TakePart. Fina’s craft brew pub will be 100% women-owned and operated. Talk about market disruption! As far as what kind of beer they’ll be brewing, their goal is to use ingredients already being grown in Rwanda. These ingredients include bananas, sorghum, cassava and millet. Banana beer in particular is a popular drink in East African nations. Rwanda stands out as a country making great strides for the empowerment of women and gender equality. During the 100 day genocide of 1994, nearly one million people were killed and Rwanda is still recovering. Following the tragedy, Rwandan women made up 70 percent of the population and played a major role in building a new government. Today, Rwanda boasts the highest percentage of women in government globally, with women holding 64% of government positions. And Rwanda has ranked in the top 10 countries for gender equality in the World Economic Forum’s annual report. Josephine Uwineza is an extraordinary example of what can happen when women are empowered to reach their full potential. According to Girl Talk HQ, Josephine was able to make her dream a reality through investments from other female entrepreneurs. “Rwanda really encourages women to try in any business. My main concern is the women in the village who are going to grow the raw material. Those are the people I’m going to empower, because this is a demand that’s going to be constantly needed,” she told TakePart.com. Women have been among the pioneers in the craft beer revival starting in the 80’s and have attracted more and more women to the ever-growing craft brewing industry. In fact, women have taken a commanding role in the craft brew industry. There are many women, like Josephine, who are committed to changing the way people think about craft brew industry and who are making an incredible impact. Here at Greenwood Brewing, it’s important that we do the same – we want to keep the conversation going and continue to help empower women all over the world. Thank you, Josephine, for inspiring us! Ready to dive into different brews and the stories behind the people who drink them? Subscribe to Greenwood Brewing now!